From Day One, the Moschino brand has been a fascinating fusion of thought-provoking design and couture values – but always with an irreverent edge. At first sight, Moschino – which made its catwalk debut in Milan in 1983 – often seems downright kooky. Is there another designer who has obscured hats and scarves with cuddly teddy bears, or embroidered ‘Waist of Money’ on a jacket, in place of a belt…? Moschino‘s always been known for wild humour, irony – but also for its beautiful finish, and for clothes which transcend seasonality and become (in some cases) actual museum pieces. Elegant design, perfect mastery of the classic techniques of ‘cutting and stitching’ – maintaining the Italian fine tailoring tradition – together with a sharp, often mocking humour are Moschino trademarks. Today, the founder’s enthusiasm for Surrealism continues to shine through everything Moschino creates. 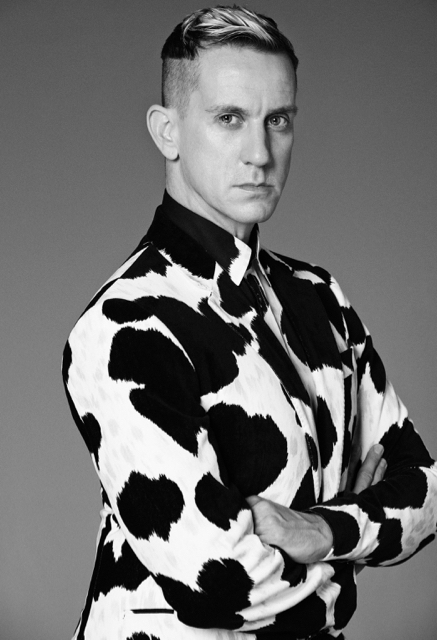 The Moschino flame now carried by the maverick designer Jeremy Scott, below. Born in Missouri, Jeremy Scott studied Fashion Design at the Pratt Institute, relocated to Paris and in 1996 and 1997 won the Venus de la Mode Award for Best New Designer. He joined Moschino in 2013. Since then, he has continued to make fashion headlines with his eye-catching catwalk designs and smile-inducing (yet always utterly chic) accessories. His Spring/Summer 2016 collection featured bags in the shape of traffic cones, for instance, with a dress like a giant yellow feather duster, while the Spring/Summer 2017 show was a life-size collection of paper doll clothes. Beyond that, he has been the creative driving force behind some of the most striking fragrance bottles to hit our dressing tables in many, many years. The first of his fragrant unveilings put a massive grin on our faces when Jeremy Scott unveiled it to the press at Harrods in 2014: the first time a teddy bear had masqueraded as a scent bottle. ‘I Am Not A Toy‘ perfume became an instant sell-out, drawing a queue which stretched round the Knightsbridge block. 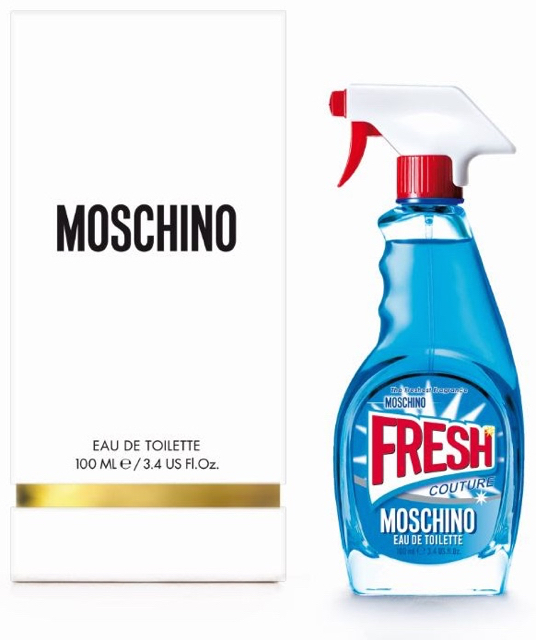 The bottle’s cuddly appearance belies the sophistication of what’s inside – but that element of surprise is typical of Moschino. You remove the teddy’s head to reveal the spray – and enjoy citrusy woody-floral top notes of juniper, mandarin, bergamot and spicy cardamom. Violet, hawthorn petals and lavender come together in its floral heart, and as the fragrance is skin-warmed, the base elements of cedarwood, sandalwood and vanilla beans develop a very huggable warmth. Showcased in our Scent With Love Discovery Box, Fresh Couture uplifts with zesty mandarin and bergamot, before a raspberry juiciness and rich ylang ylang accord sweep in, adding intrigue. Delicate notes of osmanthus and white peony give away to an inviting accord of cedarwood, ambrox and white patchouli, in the dry-down. If that’s not enough to make you smile, take a look at the advertising, above right – which featured legendary supermodel Linda Evangelista in the role of cleaning lady.